This post, from Berkley statistician Joey Richards, is one of three marking the end of this phase of the Galaxy Zoo : Supernova project. You can hear from project lead Mark Sullivan here, and from the Zooniverse’s Chris Lintott here. Thanks to the efforts of the Galaxy Zoo Supernovae community, researchers in the Palomar Transient Factory collaboration have constructed a machine-learned (ML) classifier that can reliably predict, in near real-time, whether each candidate is a real supernova. ML classification operates by employing previously vetted data to teach computer algorithms a statistical model that can accurately and automatically predict the class for each new candidate (i.e., real transient or not) from observed data on that object. The manual vetting of tens of thousands of supernova candidates by the Galaxy Zoo community has provided PTF an invaluable data set which could be used to accurately train such a ML classifier. The ML approach is appealing for supernova vetting because it allows us to make probabilistic classification statements, in real-time, about the validity of each new candidate. Further, it allows the simultaneous use of many data sources, including both new and reference PTF imaging data, historical PTF light curves, and information from external, on-line sources such as the Sloan Digital Sky Survey and the U.S. Naval Observatory. In total, our automated ML algorithms use 58 metrics about each supernova candidate, all of which are available within seconds after PTF detection of the candidate. These metrics—features in ML parlance—are fed into a sophisticated algorithm, which uses the aggregate of information from more than 25,000 historical supernova candidates which were rated by the Zoo to instantaneously determine whether each newly observed candidate is a supernova. False Positive rate and missed detection rate for human and machine classifiers. Our “ML Zoo” has been operating since the beginning of 2012 and has been thoroughly tested against the Human Zoo scores. 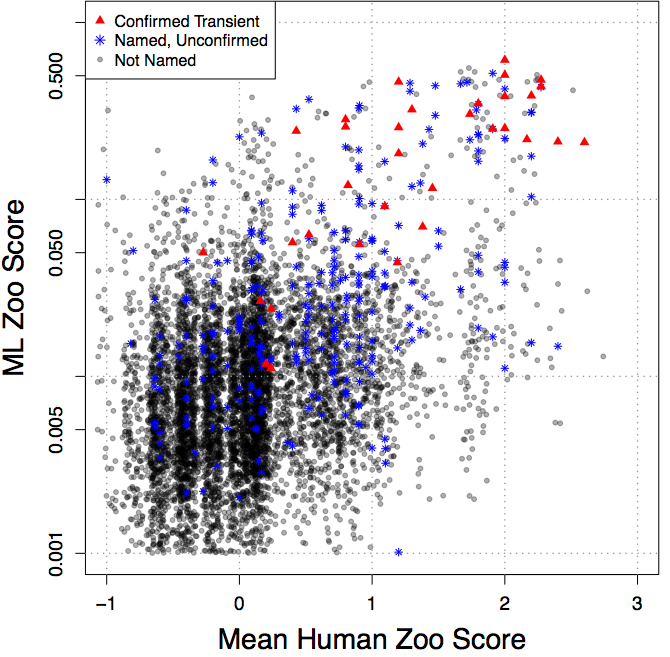 We found that the ML Zoo scores correlate reasonably well with the average Human Zoo scores for 7000 supernova candidates observed during the first 3 months of 2012 (Figure 1). We also discovered that the ML Zoo is more effective at finding supernovae. In Figure 2 we show a plot of the supernova false positive rate (% of non-supernovae that were classified as supernovae) versus the supernova missed detection rate (% of confirmed supernovae that were classified as a non-supernovae) by both the Human an ML Zoos for 345 spectroscopically confirmed supernovae from 2010. 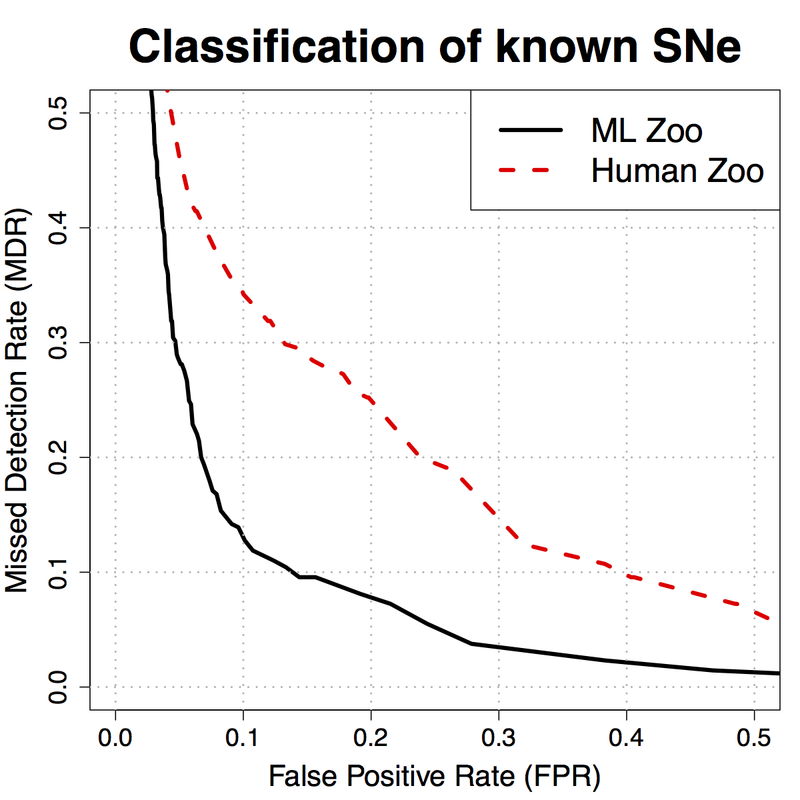 Indeed, the ML Zoo achieves a smaller missed detection rate at each false positive rate. 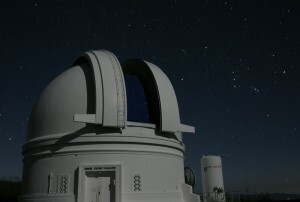 analyze large collections of astronomical data. 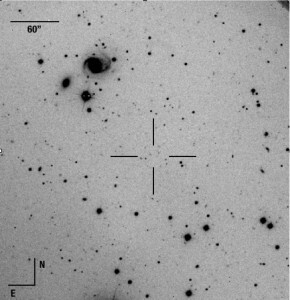 The supernova named ‘PTF10ops’ was discovered by the supernova zoo using images from the Palomar Transient Factory Telescope in California and a report on this interesting SN has now been accepted for publication in the journal, Monthly Notices of the Royal Astronomical Society. Thanks to the very rapid discovery of this supernova by members of the supernova zoo, we were able to start taking observations very soon after explosion with many telescopes around the world such as the 4.2 m William Herschel Telescope on the Canary Island of La Palma, the 3 m Shane telescope at the Lick Observatory, California and at one of the two 10 m telescopes located at the Keck Observatory in Hawai’i. An image of the field of PTF10ops (located at the centre of the crosshairs) taken with the WHT+ACAM on La Palma, Canary Islands. The largest galaxy with spiral arms located in the upper left quadrant is the host galaxy of PTF10ops, located at a distance of 148 kpc from the supernova position. This is the largest separation of any SN Ia discovered to date. PTF10ops turned out to be a very interesting supernova – a peculiar type Ia supernova. Type Ia supernovae are explosions that occur when a white dwarf (a small, dense star) collapses when it pulls matter from a companion star and grows to have a mass of more than 1.4 times that of the Sun. At this critical mass, a thermonuclear reaction is triggered, that destroys the star in a massive explosion that we call a type Ia supernova. Type Ia supernovae are very important because they are used as cosmological distance indicators and were used in the discovery that the expansion rate of the universe is accelerating. PTF10ops had unusual observational properties that suggest that maybe a new type of supernova explosion has been discovered. It is located very far from its host galaxy, actually the farthest supernova from the centre of its host galaxy discovered to date. Its spectra also contained signs of rare elements such as Titanium and Chromium. In normal Type Ia supernovae, how long a supernova stays bright is directly related to its peak brightness, but PTF10ops did not follow this rule and stayed brighter for much longer than expected. It is still unclear what it was about the star that exploded that produced this unusual supernova, maybe it was very old star or maybe we are seeing some sort of new, unknown explosion. In the future, we hope to take images of more objects like this using the Palomar Transient Factory and then with the invaluable help of the supernova zoo members, we can catch these supernovae very soon after explosion and start follow up observations immediately to get images and spectra to better understand these rare supernova explosions. P.S. Here’s the piece of the paper crediting the discoverers – well done all! The true test of any citizen science project is whether it actually makes a contribution to science. That contribution can be small, but the thought that you’ve made a difference, no matter how small, to what is known about the Universe is a fine one. We know from the interviews our education research team have conducted that it motivates you too, so I’m delighted to announce that the first paper from Galaxy Zoo : Supernovae has been accepted by the Monthly Notices of the Royal Astronomical Society. With the first Zoo 2 paper published by MNRAS this week, it’s in danger of becoming our in-house magazine (! ), but this is seriously great news. 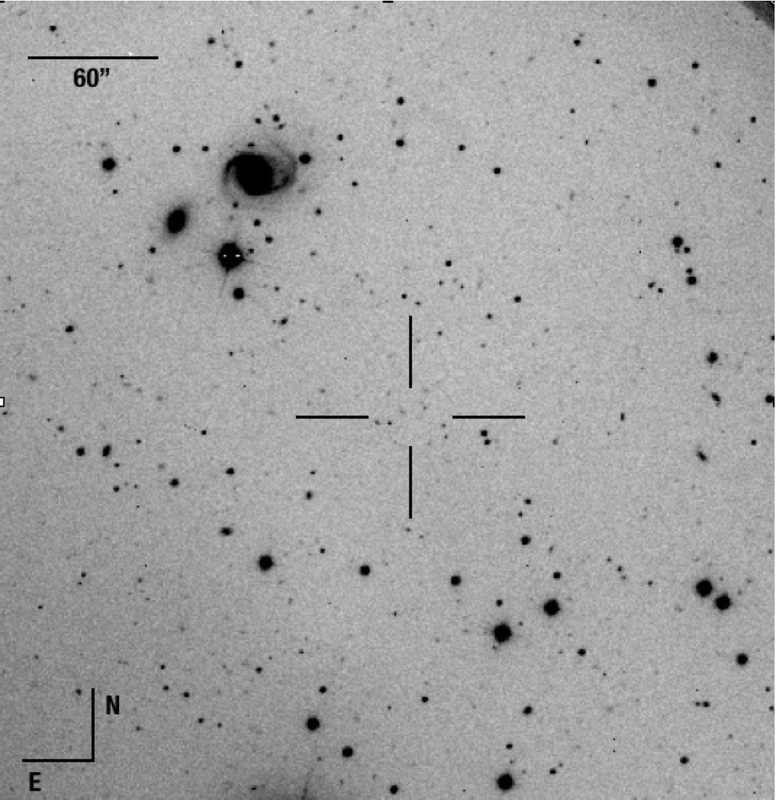 The paper, put together by 24 authors from the Zooniverse and the Palomar Transient Factory along with classifications from nearly 3000 Zooites, reports the results from the early trials of the supernova project which ran between April and July 2010. If you’ve been following the progress of the project, then it’ll be no surprise that things went well. In fact, the results are remarkably good. From the nearly 14000 candidates processed in that time, we caught 93% of the supernovae in the sample, and not a single candidate identified as a supernova by the Zoo was a false alarm. The key to this result is the scoring system the Zoo uses. Depending on the answers to the question presented, candidates end up with a score of -1, +1 or, for really promising candidates, +3. If the average is above 1, then the candidate is probably a supernova. The team conclude that there is room for improvement here, particularly in reducing the number of classifications needed for a definitive decision. This isn’t that important right now, as the classifiers signed up to our email alerts are doing a sterling job, but as we expand to include more data, including supernovae from other surveys, it will become more important. For now, though, please do consider helping out. Our latest paper shows that you’ll be making a real difference to PTF’s search for the exploding stars that might reveal our Universe’s fate. P.S. On a personal note, congratulations to lead author Arfon on his first paper as lead author since leaving astronomy for web development a few years ago….